Photo stickers are a fun and economical way to share baby's picture. You can get 6 photos to a sheet on the large stickers, and 20 photos to a sheet for the small stickers. 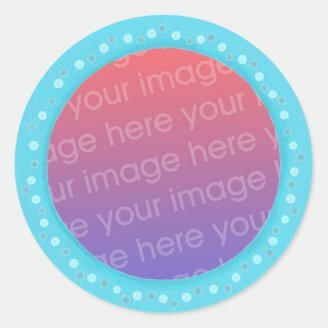 Recipients can then place the sticker on a card and frame it, add it to their scrapbook, carry it in their wallet, share with friends, etc. for announcements, baby showers, and more. Everyone loves to share photos of the new baby. Individual pictures can be expensive. Another way to share photos, with the help of the internet and print on demand companies, is online stickers. The image will be printed right on the sticker for a professional look. 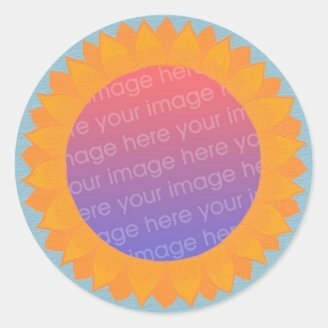 Baby Photo Stickers are ready in a variety of styles and colors. You can go with the traditional colors of pink and blue. You can get them accented with polka dots, and also choose from a cute sunflower design. 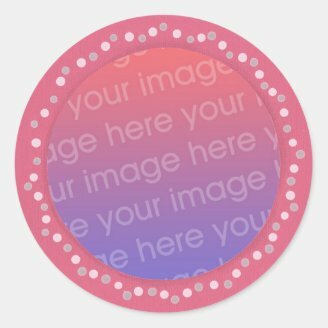 These stickers have a template placeholder for where the photo will be. Click on the sticker, then replace Your Image Here with a photo that you have stored on your computer. These stickers can be ordered in 20 per sheet, each sticker being 1-1/2 inches wide. They can also be ordered in a larger size of 6 stickers per sheet, each sticker being 3 inches wide. I've found it best to start with an image that is larger than what you actually need for the product. The photo you have stored on your computer may be a bit too large or too small for the photo placeholder on the sticker. Here's how to adjust that. First, start with an image that is large enough on your computer, i.e. as large as or larger than the photo would be on the product (large is best in case you need to adjust it). A good size to start with would be approximately 10 by 12 inches. You wouldn't want the image to look grainy by making a too small image bigger. Also, make sure that the resolution is at least 200 ppi (pixels per inch), 300 is better. Once your image is large enough on your computer, click on the product that you want to add the image to. Under the photo placeholder, click on Change, and select the image from your computer that you want to upload. Once the image has been uploaded, check it out. Is it a good fit? If so, you're ready to type in your quantity (if different than what is shown) and hit your Enter button, and place your order. If the photo size needs resizing, click on Customize It. Once the new screen appears, you can click on the Design button, then click on the image. Then click on a corner of the image and move outwards to increase the size or inwards to decrease the size. You can also click on the image and drag it to reposition it. Click on the Product button to see how it looks, and make any adjustments by repeating the previous steps in this paragraph. If you have any other questions, feel free to ask them here. I will try to clarify any instructions. Thank you Pukeko. It's a fun and economical way to share lots of pictures of baby. Cheryl, this is such a great idea for new parents. These are cute. They'd be nice to put on baby announcements.